In the next live chat of the T.O.F.U. Talks series, T.O.F.U. 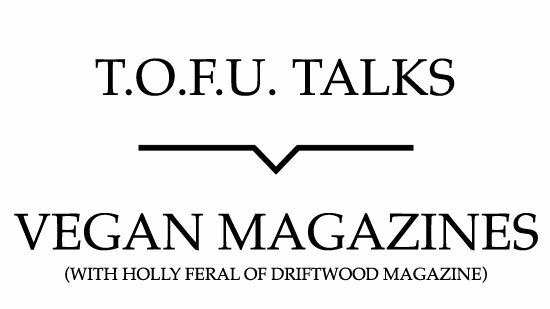 Co-Founder and Editor, Ryan Patey, will be talking with the Editor-In-Chief of Driftwood Magazine, Holly Feral. Starting at 7:30PM PDT this coming Friday, the two will discuss publishing vegan magazines as activism, the ups and downs of the industry, the place of print in a digital world, and more before taking questions from viewers. Note: The event will be happening on the Face2Face platform, not through Facebook. When the event starts, you will be able to join here. For those on a mobile device, you can view the chat on T.O.F.U.’s YouTube channel. However, you unfortunately will not be able to post questions. Compassionate exploration began for Holly 14 years ago in the North American South, where animal rights have yet to find a spotlight. Holly cut her teeth working for community papers and the Tennessean. Freelancing as a writer and photographer since 2006, she has experimented with fine art photography, historical processes and freelance commercial photography since moving to the Pacific Northwest. Driftwood is the travel and culture digest for the graduated vegan. Each issue brings you stories of vegan travel adventures, profiles on people, and advancements in our global community. Driftwood aims to break away from the entry-level content that fills most vegan magazines, the recipes and celebrity lists, and explore what lies beyond the threshold. Driftwood is a celebration of what is possible in a vegan world. It’s a place to see other vegans and celebrate our world with and through each other. The publication launched in 2015, in simultaneous print and digital editions.